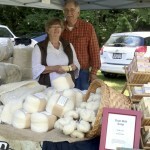 Beyond a great abundance of food and drink, you can find body-pampering creams, oils, scrubs, and soaps, and hand-sewn, -painted, -woven, -knitted, -felted things to delight you. If you are in the mood to adorn yourself or a friend, there is beaded, woven metal, enamelled, stone, crystal, and silver jewellry—even earrings made of bicycle tubes! Want a ceramic bowl? A painting? It’s all at the market. 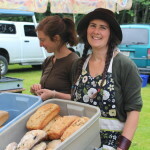 Regardless of whether they are ten-year veterans or first-season vendors, people consistently bring new products as well as traditional favourites of Denman market-goers. What follows is just a sampling, and you will have to come out on a Saturday morning to find treasures for yourself. Aside from the crêpes à la Crêpes d’Azure, which have become a bit of a tradition at the market, Véronique’s espresso is one of the things people line up for—made in the traditional style with an Italian stovetop espresso maker. Sue’s Hard-Working Cream for Hands and Feet has been selling out this season. Fern’s handmade lanolin soaps and Tub Tea, and Teresa’s essential oil mood-shifting inhalers are also favourite purchases. Teresa noted, however, that it might be her gluten-free, dairy-free brownies that are her current best seller. ‘Dairy-free’ leads me to two of the vegan foodies: James and Tanya, and Pei and Nelson. James, The Very Good Butcher (“We butcher beans!” is the tag-line) is selling a lot of Spicy Black Bean Burgers—more burgers than Taco Stuffing? We’re not sure yet. People are lining up for Pei’s lunch plates: imagine a hot, nutritious and deliciously herbed-and-spiced vegan meal. Leandra and Bruce’s stall is traditionally a place where you’ll find a lineup. The Kale and Feta Rolls have reached the status of ‘addiction’, a few customers confessed, and the ‘fusion-cuisine’ samosas usually sell out, too. Watch their table for special seasonal surprises—last week, pie cherries. Corlan Vineyard (Pat) blueberries are best sellers, along with their strawberries and raspberries. And, organic sulphite-free wine, which you can taste at the Corlan stall. From wine to bread (a jug of wine, a loaf of bread…, from the 12th Century Persian poet Omar Khayyam): Magdalena Anna (Magda’s Breads) told me that her loaves of whole wheat, rye, or spelt “sell themselves”. 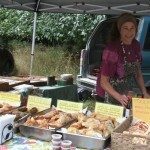 This means, people in the know visit her stall early to make sure they get their bread. Yogi and Bronwyne (Middle Eastern Munches and More!) sell out of their Jerusalem Bagels so quickly that last week they made almost twice as many, and still sold them all. They brought pitas for the first time last week, and I’m thinking those will also soon be selling out. I may not need to remind you of Mary Hicks’ oven-warm cinnamon/sticky-buns. These are the reason people loiter near her stall, hoping to be first in line when she arrives—definitely an all-time Denman best seller. Should you want jam or jelly with your bread (or toast? 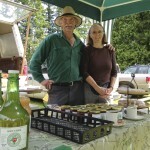 ), preserves are in good supply: Karin, Nita, and Robin all have some tempting choices. Robin’s Pear Ginger Marmalade outsells her other preserves; she makes it with Asian pears from her orchard. Karin entirely sold out her first batch of Rose Jelly (from the flowers, not the hips). She collects the petals from her own unsprayed roses to make this divine treat. If you’re more into nut butters, visit Megan Rose (Rose Pedals Jewellry) for a jar of her hazelnut-chocolate spread, made with Denman hazelnuts. Don’t delay, though; Megan anticipates being sold out for the season fairly soon. Veggies are one of the foundations of a farmers’ market, and we can’t really speak in terms of best sellers because it is all about which crops are ready when. We can identify a few Denman favourites, however: salad mix, for example. Go to any of the produce vendors: Jeremy and Kerri (Rhubarb Ranch), Sam and Emily (Two Roads Farm), and Veronica (Alveroni Gardens). Veronica’s imaginative variation on the theme is to have you select some micro-greens to go into the salad mix. 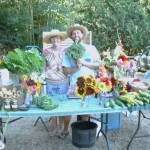 Keep an eye open, too, for Tracy (Ruby Slipper Ranch) with her antique shopping cart brimming with farm produce. 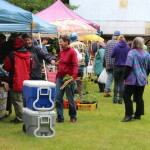 Our farmers, market gardeners and cooks bring an astounding volume and selection of food to the market, and seem to sell an astounding amount. 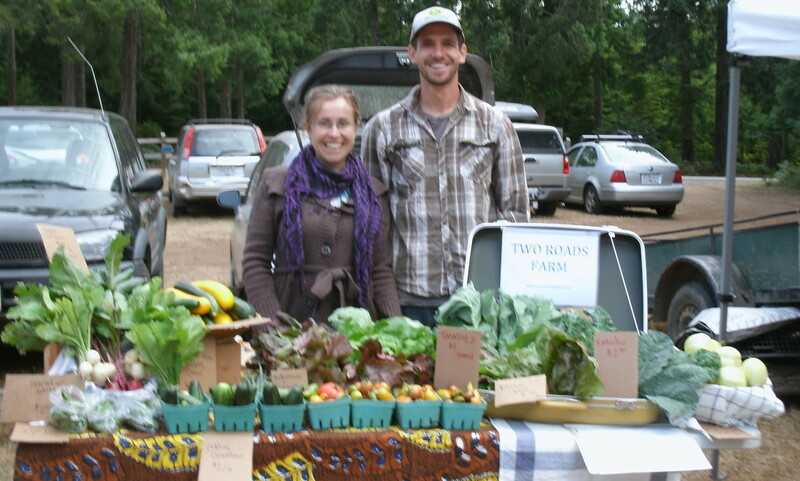 The lineups at some stalls are a tribute to skilled farming and bountiful harvests (and some great recipes!). One of my favourite overheard exchanges was a couple of weeks ago near one of the vegetable stalls—a mom talking about the amount of carrots her family goes through and how, now that she can find lots of carrots at the market, she no longer needs to buy “the big bags from Costco.” To me, this is a sign of the success of our market. Denman Feeding Denman, as the Growers and Producers Alliance slogan goes (and as it says on the Graffiti Fence).